CLEAN sand (you can buy this at craft stores–beach sand is not suitable as it has organic matter which will smell and decompose. Just take my word for it). Make sure your jar and lid are clean and dry. 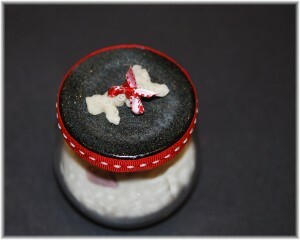 Spread the Mod Podge on the lid top with a brush.. Smooth the tissue paper over the top of the lid and over the sides. Let it hang over below the bottom of the edges. 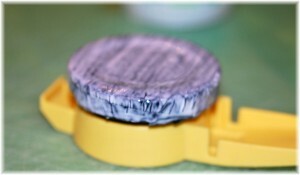 Brush more Mod Podge over the paper, and allow it to dry. Don’t worry if it doesn’t look perfect at this point. The edge is going to be covered with ribbon, so imperfections aren’t going to show. Just set it aside, out of the way, while you finish the rest of the project. 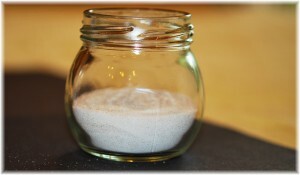 While it is drying, add enough sand to your jar to fill it between one third to one half full. 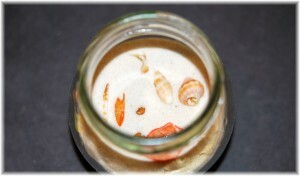 You will need to decide how much is most pleasing to you, and it will depend on how many shells you want to put into it. Too much sand will cause you shells to get “lost and not enough will obviously not look very pleasing. You can play with it, and if you don’t like the way it looks you can always redo it. 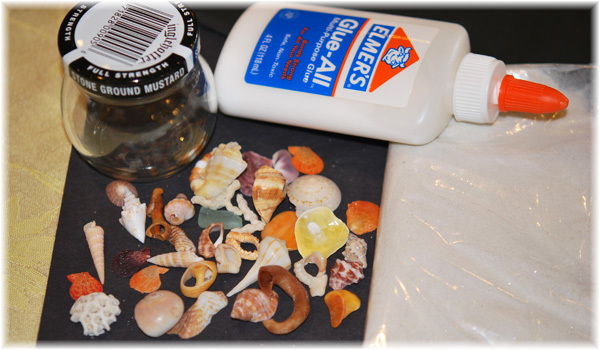 After you add the sand, lay out your shells and decide which ones you like the best and which are must haves. If you are making this for someone else, let them decide which shells they want in their jar, after all, it’s about their memories. If you have very large shells they may not fit, or even if they do, they may not be in harmony with the size of your jar or your other items. This is the fun part, but it may take some trial and experimentation to get a collection you like. You will probably have some left over that just don’t fit, either literally, or aesthetically. So, add some of your shells, until you think you have a nice amount. Then, carefully shake your jar until the sand shifts. You will see that the shells drift down into the sand. Now add some more shells, and repeat the process. Continue this several times, adding a few more shells each time. Don’t add too many shells at a time, or you may just end up with a jumble of too many shells that will look like a big mess. That’s not what you want. You want a nice mix, just enough, but not too many. 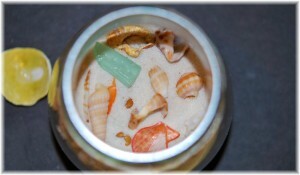 This is a pleasing mix of shells, and even sea glass. I want to mention that you don’t have to have only perfect shells. I find that broken and well worn shells can be quite interesting and beautiful. Worm tubes and worn beach glass, pieces of shell that look like stones in beautiful colors, small bits of coral and the center spirals of shells are all lovely additions to your collection. 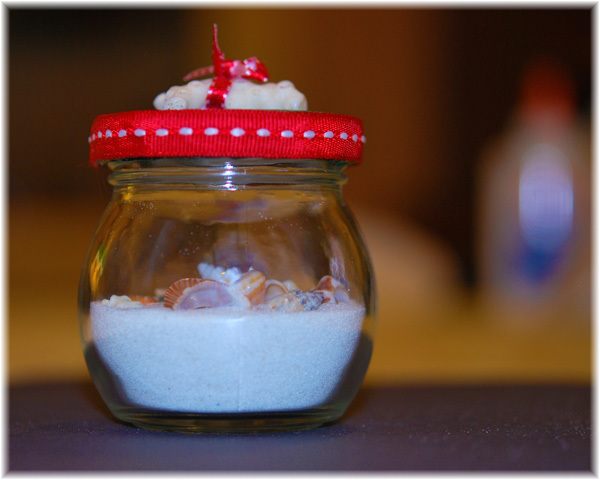 Of course, whatever catches your guests eye is what should go into their jar, and if you live near the beach you probably have your own favorite things. Once you have finished selecting all of your shells, choose one more nice piece for your lid. A particularly nice shell, beach glass, or coral. I chose an interesting piece of coral to top off the lid. Make sure the Mod Podge is dry (which can take a couple of hours). Trim the edges of the paper even with the edge of the jar. Cut a length of ribbon just slightly longer than the circumference of edge of the lid. Using the Glue Dots, stick it to the edge, slightly lapping the edges. Glue your decorative piece on top using Elmers Glue-All. Allow to dry completely. 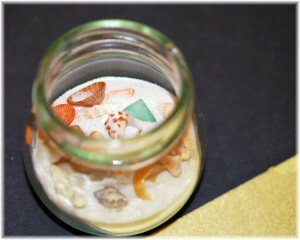 Now, you have a treasure for your guest, to remember a wonderful visit to the seashore! I had thought the same thing, about doing things other than shells. Dried corn maybe? I know they make jewelry with it. And pretty stones? But yes, anything that will deteriorate over time would be a bad choice. No snowflakes. 😉 Thanks for coming by! I figured out the RSS feed. Now you can make some for people who come visit! I seem to always use jars, but now I have run out. 🙂 Thank you for being such a good supportive friend. I still have this sitting on my glass shelves in the hallway. I’m glad you enjoyed it, it was so easy to do. I thought I should make one for when the kids bring my grandson up to visit!